Shopping center Mega Mall was built in the CBD (Central Business District) Batam are Batam Centre, so we called MEGA MALL - BATAM CENTRE, mall is directly connected by a bridge to the International Ferry Terminal - Batam Centre, which has now reached capacity turnaround tourists and business people from foreign countries and Singapore about ± 300,000 people per month are served by a 98 day trip ferry transportation to the destination of Singapore - Batam Centre - Singapore or equal to 2,940 trips per month. Batam Island is located right next to the Southeast of Singapore that we know as one of the world's financial center and a shopping heaven with a distance of only ± 20 Miles from Batam Centre. The rental price of shopping centers in Singapore 10 times more expensive than in Batam - Indonesia (1:10). Standard wages paid retail company in Singapore, a 10-fold higher compared in Batam. Harbor Front Ferry Terminal Singapore has been linked directly to the MRT network to the entire country of Singapore, so that Singaporeans who live in extreme among other western area of Woodland, the northern region of Punggol and the east Pasir Ris, can more easily towards Mega Mall - Batam Centre which has facilitated 98 cruise ferry trip majors Singapore - Batam Centre (PP) per day. On the other hand with a comparison rate of Rp. 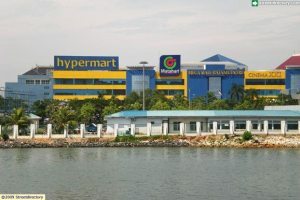 6.776 = SGD 1:00, this condition certainly provide a boost more significant for citizens of Singapore for shopping in Batam with a very cheap price, especially when it has reached the transport network is practical, the mall also provides a shuttle bus that serves the tourists towards places like Hotel, Plaza and other nearby attractions.